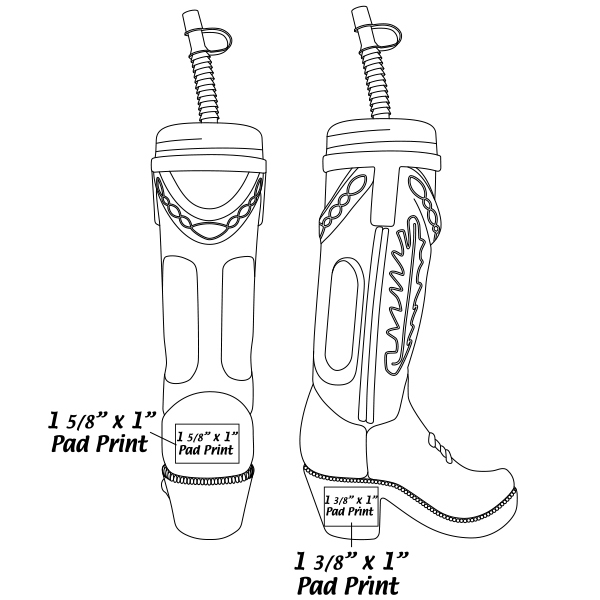 Add to the accents at your western theme promotion with our 10 3/4" plastic black boot shape yard glass with its own straw and easy to hold handle.. Our plastic Western Black Boot Glass is approximately 10 3/4" long and features a removable clear top and straw and holds approximately 32 ounces. Perfect for your drinks at a good old fashioned hoe down, wild west party and to add fun and functional with our easy to hold Western Black Boot Glass. Fill with your favorite brew. Above pricing includes a 1 color imprint in 1 location. For all imprinting add a Set-up fee of $55 (v). We may offer additional locations and up to 4 spot colors, PMS matches acceptable @ $14 (v) per color. For each additional location and for each additional spot color add a Set-up fee of $55 (v) and a running charge of $.25 (v) per color, per location. Imprint Minimum is 200 pcs. Imprint Method: Pad Print Only. Production Time: 2 - 3 weeks after receipt of artwork and approval.